Oil price up 3.4% today, what caught out eyes is this UMS, equipment manufacturer for Semicon and Oil and Gas, breaking 3 month high is a good sign of the stock as this show that there might be a trend forming. and from our smart money index below, show many Blue bars, this shows accumulation. 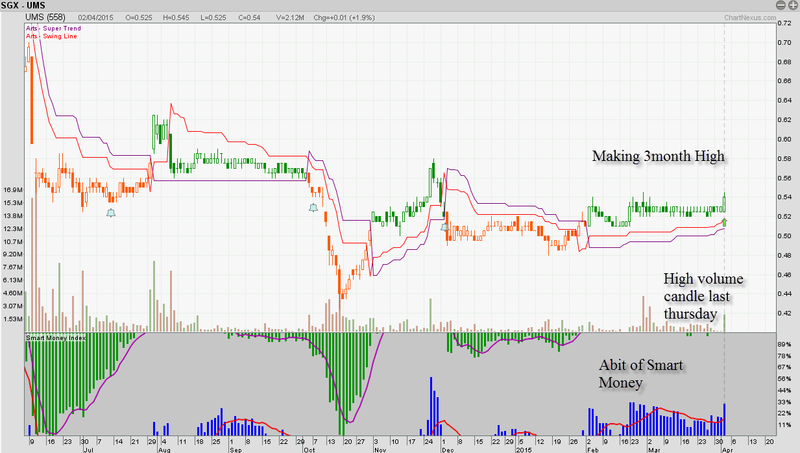 Stoploss can place at 0.52 incase there is a sudden turn around. UMS Holdings Limited is a Singapore-based company. The Company provides equipment manufacturing and engineering services to Original Equipment Manufacturers (OEM) of semiconductors and related products. The Company is in the business of front-end semi-conductor equipment contract manufacturing. It is also involved in complex electromechanical assembly and final testing devices. The Company operates in two segments: semiconductor, which provides precision machining components and equipment modules for semiconductor equipment manufacturers; and contract equipment manufacturing (CEM), which is a supplier of base components to oil and gas OEM. Its products include modular and integration system for original semiconductor equipment manufacturing. UMS Holdings Limited operates in Singapore, Malaysia and the United States.